It is a well-known fact that Rajasthan has a cultural heritage that is incredibly vibrant, and rich with colours and emotions. Being a regal state, it depicts an extensive range of customs and enjoyments. 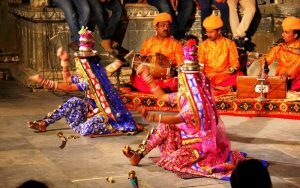 Apart from the many handicraft arts, Rajasthan is also home to numerous cultural dance forms which are enjoyable for audiences of essentially every demographic. We, at Rajasthan Film Festival, aim to integrate some of these astounding dances in our award show with the aim to promote and develop appreciation for traditional arts of the state. These dances are performed by professionals and also college students, in an attempt to inspire the youth to invest in their heritage and culture. 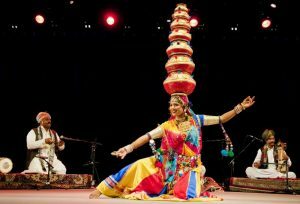 The Bhawai dance involves women dancers balancing up to ten matkas on their heads and dancing simultaneously. In a nail biting act, the supremely skilled dancers balance a number of earthen pots or brass pitchers and then sway, with the soles of their feet perched on the top of shattered glass, and sometime on the edge of a naked sword or on the rim of a brass thali (plate) during the performance. A male musician playing the background music is the accompaniment of the skilled Bhawai dancers. Generally, a melodious Rajasthani folk song is sung by the musicians, adding to beauty of the dance. Many instruments like pakhwaja, dholak, jhanjhar, sarangi and harmonium are played as background music. The dancers are adorned beautifully. They dress traditionally in colourful Rajasthani ghagras, making the performance look even more attractive. A challenging dance form, this has originated form men of the Banjara community. This enchanting folk dance is believed to be a dance of tantric powers of the Jasnathis. This dance performed on a large ground, spread with live wood and charcoal. A vast ground is necessary for this form of dance to make room for live wood and charcoal to be piled and the Jasnathi men and boys leap on to the fire to the accompaniment of drum beats. The music gradually rises in tempo and reaches a crescendo and puts the dancers in a trance like state. 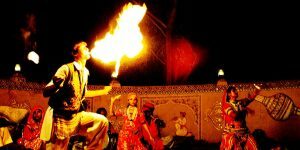 The dance involves breath-taking fire stunts which the dancers perform by holding flaming torches in their hands and filling up their mouths with kerosene. The dancers perform their actions as if they are blessed with a divine protection. Performing on a large bed of flaming coals is considered to be a specialty of this category of dance. 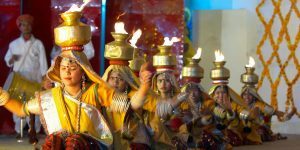 This dance describes the troubles travelling miles on foot and collecting water in a chari or pot by the Rajasthani women in their everyday life. The resulting joy of obtaining water as they draw closer to home is reflected through Chari dance. This folk dance is performed by groups of dancers. In Chari dance woman balance the chari or pots on their head and a lit flame is then placed in the pot. This popular dance form belongs to Gujjar community of Kishangarh. It is performed by women only. These ladies carry brass pots on their heads balancing it to perfection. These pots are kept ignited with cotton pods dipped in oil. These lit pots create mesmerising moments in the dark night. The women move together to the beat of the music. The popular Ghoomar Dance in Rajasthan India is known to be the characteristic dance of the Bhil tribe. Ghoomar, sometimes called Jhumar, and is performed ecstatically by women of any age group as it has simple, swaying movements. Its specialty is its intricate footwork. There is no end to this folk dance as it may continue for hours and across the whole night. 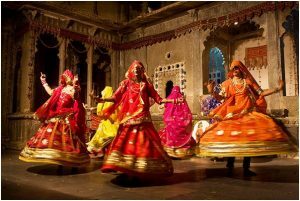 Dancers performing Ghoomar move in a circular motion with clockwise and anti-clockwise directions, while spinning at the same time. This brings out the beauty of their dance as their colourful, embedded ghagras fan out beneath their waist. Synchronization of footsteps with the beats of the songs as the tempo of the dance increases, the dancers twirling swiftly makes it a magnificient spectacle to behold. The Kachhi Ghodi Dance is one of the most popular folk dances of Rajasthan amongst tourist audience. This folk dance originated from the bandit regions of Shekhawati and is often performed for the entertainment of the bridegroom’s party. This dance is performed by men on dummy horses. 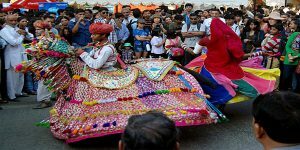 The performers wear elaborate costumes; usually red turbans, white dhotis and kurtas embellished with brilliant mirror-work, as they ride the dummy horses. These dancers move rhythmically to the beating of drums and fifes being played and hold a naked sword in hand. A singer narrates the exploits of the Bavaria bandits of Shekhawati region through his song, to which the men dance. Kalbelia dance is specifically performed by a Rajasthani tribe called ‘Kalbelia’. 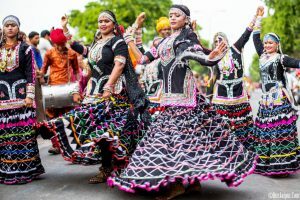 The fame of this dance is vastly spread across the worlds, such that Rajasthan’s Kalbelia dance and songs are now in UNESCO’s representative list of the Intangible Cultural Heritage of Humanity from the year 2010. In Kalbelia dance, males play various traditional instruments to support the females as the sway the night away. Kalbelia dance is one of the most sensuous dances among all Rajasthani dances. The Kalbelia tribe is a community of Rajasthan which was known to live their life as nomads rather than making their homes at one place. Kalbelia people are known to have the main occupation of catching snakes and trading snake venom. Kalbelia folk dance is performed by females on the tunes of been (snake charmer’s instrument) on the occasion of joy in the Kalbelia community. They traditionally dress in black outfits with intricate colourful work on their clothes. There is no any organized system, manuscripts, or written text to teach and learn Kalbelia songs and dance. This folk art is transmitted verbally from generation to generation. Rajasthani Kathputli dance has international recognition and is well known as the puppetry dance. It is derived from the old tradition of stories from mythology and legends being told through puppets in Rajasthan. 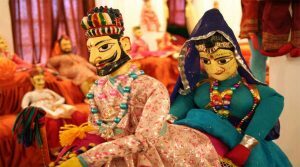 String puppetry is very much famous in Rajasthan. Traditionally, the stories told through Kathputli are based on folk tales and stories. Scholars believe that folk tales convey the lifestyle of ancient Rajasthani tribal people. This folk dance is performed by the Kamada tribes who are traditional snake charmers. Besides this it is also performed by the tribes of Mirasi, Bhand, Dholi, Bhat and Nat, to honour their folk hero, Baba Ramdeo. It begins with women sitting on the floor before his image and gradually rising to the music. Terah Taali is generally performed by well skilled artists. Thirteen manjeeras (small, round brass discs) are tied to various parts of their body, which they strike with the ones they hold in their hand. This creates a rhythm on which the dancers move. The dancers create attractive visuals with their hands and the same time may also balance pots in their hands and hold a sword in their mouth.